72 Watts of cooling capacity at 0°C delta T.
Complete assembly Liquid cooling exchanger to be used a chiller, gas dehumidifier, fluid cooling, or recirculating chiller. Fully assembled ready to connect to power. Terminal block for quick and easy electrical connections. Fans and TEC power have separate terminals to allow independent control. Foam insulation to minimize backward heat transfer and reduce noise and vibration. 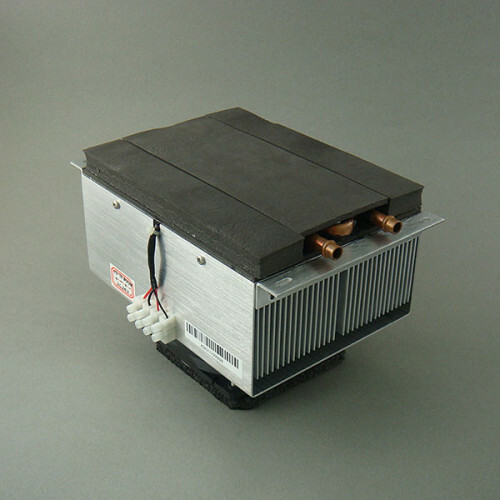 Also known as; peltier liquid chiller, thermoelectric liquid chiller, solid state liquid chiller. NOTE: (1) Due to file size, some of the downloaded files may be compressed in a .RAR archive. Please go to www.7-zip.org to download a free program to decompress these files. (2) Many of the 2D and 3D CAD models are "Defeatured". This means the 2D and 3D CAD models provided may withhold details and dimensions of the internal structures in order to protect the proprietary features of the product. By downloading any of the above CAD files, you accept the conditions of our CAD Disclaimer.